Mitsubishi Electric is a world leader in ductless cooling and heating air systems—and #1 in ductless technology in the United States. Conn Mechanical Systems is proud to sell, install, and service high-quality Mitsubishi Electric heating and cooling equipment. Why Choose Mitsubishi Electric for Your Home Comfort? Contact us to learn more about Mitsubishi Electric ductless heating and cooling products. 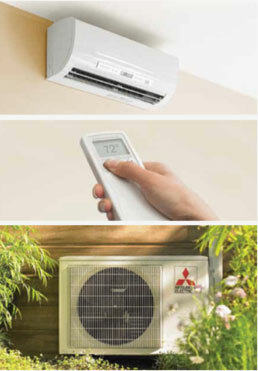 You demand the best and so does Mitsubishi Electric Cooling & Heating. Conn Mechanical Systems has been selected as a Diamond Contractor because we value the highest level of accreditation, training, and hands-on expertise. Mitsubishi Electric has only selected the finest and most knowledgeable HVAC contractors in the industry to provide you with superior sales, installation, and service support possible. Only approved contractors that have attended Mitsubishi Electric’s training classes and demonstrated advanced product knowledge are awarded the coveted status of Diamond Contractor. The status is evaluated every year and Diamond Contractors must demonstrate their continued commitment to serving customers in order to renew their status. Mitsubishi Electric provides an industry-leading 12-year factory warranty protection to back up their unmatched performance and product quality. The only way to get a full 12-year warranty is purchasing your Mitsubishi Electric product from an authorized Diamond Contractor. Contact us to install a Mitsubishi Electric system in your home and take advantage of the 12-year warranty! They offer the latest, most efficient heating and cooling systems. Their ductless systems are shown to use 25% to 50% less energy to heat and cool your home. Saving energy and money is now made easy with the multi-zone feature. Each zone (room) operates independently with its own wireless or wired remote. Each room has the ability to be different temperatures to make comfort an easy option for everyone. With Mitsubishi Electric, you can cool or heat the rooms you use often while dialing back on the rooms that are not regularly in use. The wireless control unit also senses the temperature throughout the room and makes automatic adjustments while only using the energy that is needed. No ductwork is needed which makes installation fast and requires no messy renovations. Mitsubishi Electric Ductless is the perfect solution for new additions, renovated bedrooms and office spaces, or even garage and basement work areas. Ductless systems are made convenient for a home that cannot accommodate any ductwork. Their systems are offered both outdoors and indoors. Outdoor units come in a wide variety of capacities, are compact, lightweight, and easy to install and camouflage. Indoor units can be installed relatively anywhere in your home. They fit easily on the ceiling, walls, or on the floor. Mitsubishi Electric systems also use a sophisticated multi-part filter system to reduce odors, allergens, viruses, and bacteria from the air as it circulates within a room.